Nuevo Suizo i Sevilla, Spania: Bestill nå! Upon reserving the rooms, a non-refundable first night fee will be charged from your credit card. If you wish to pay by bank transfer please contact us to this mail address, for our bank account details. 30 days prior to arrivle we confirm reservation details, and ask for the rest of the payment to be made. A no-show is treated as cancelation less the 30 days, and will be charge the full amount of the total reservation. 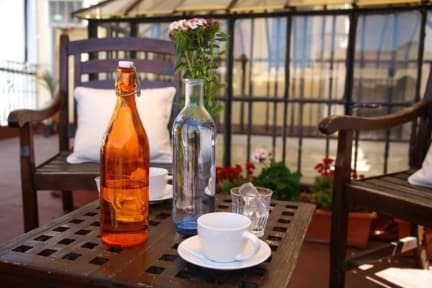 The most conveniently located accommodation at the centre of Seville, within walking distance of all tourist attractions, a great choice for single travellers of all ages, families with kids, couples and groups. Please don't forget we also offer accommodation for large groups! Our personally decorated and friendly hostel has a lot to offer. a shared fridge where you can keep your food and drinks, and an electric oven to cook. city tours are available at an extra cost. 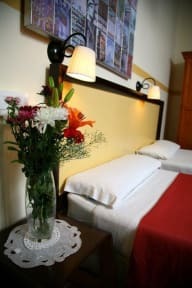 The rooms are decorated individually, equipped with TV, heating, air conditioning and they all include linen and towels, as well as free Wi-Fi. The rooms with private bathroom has coffee maker, kettle and hot chocolate inside the room . Also the guests of these rooms receive a free bottle of cava at the check in. Nuevo Suizo has a nice terrace with chill out area to relax and a corner shower, perfect for cooling, while enjoying of sunbathing. Every Wednesday, Sangria Party on the roof top: music and free appetizers! Enjoy your fun! We are here to serve you in the best way we can! If you have any special requests please let us know and we will do our best to make it possible. The hostel reserves the right to validate the credit cards prior to arrival of the clients. In the event that the credit card is invalid, the Hostel will immediately cancel the booking. Cancellation policy : Any cancellation made less then 48 hours prior to arrival time ( local check in time 14:00) will be charged the first night fee of the complete reservation. All reservations for more than 6 people or more than 4 rooms will be consider as group reservations and in this cases the hostel applies special policies. Special Promotion for reservations of groups over € 950: The transfer from the airport to the hostel will be on the house! Promotion for hen parties for reservations over 8 people will be given a limo ride to enjoy the city!